Chef Jamika Pessoa. Photo credit: Chef Jamika. 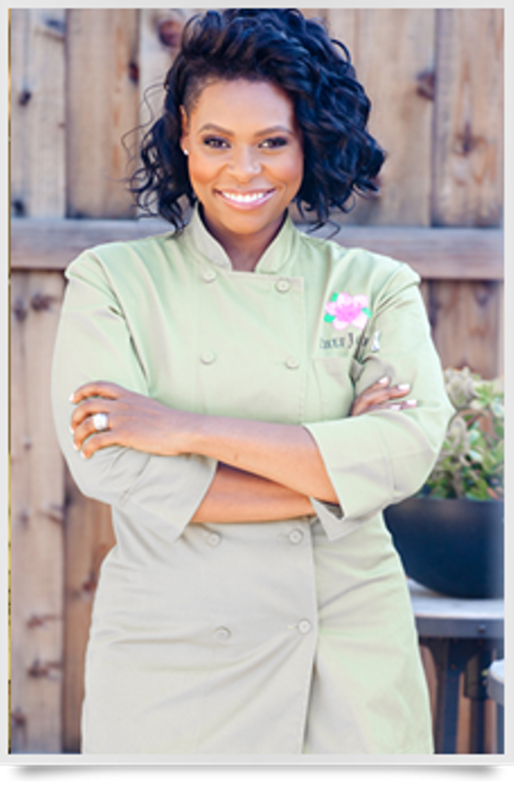 Chef Jamika Pessoa is one of my favorite celebrity chefs. This Atlanta resident built a wildly successful catering business and garnered the title “Chef to the Stars,” because of her A-list of loyal clients in entertainment and sports. Chef Jamika has serious culinary chops. She graduated from the International Culinary Schools at the Art Institute of Atlanta and studied in several European countries. It was her appearance on season 5 of The Next Food Network Star that we saw her beauty, brilliance, creativity, talent and skilled execution as she competed down to the final rounds in the competition. Chef Jamika in action. Photo credit: Chef Jamika. 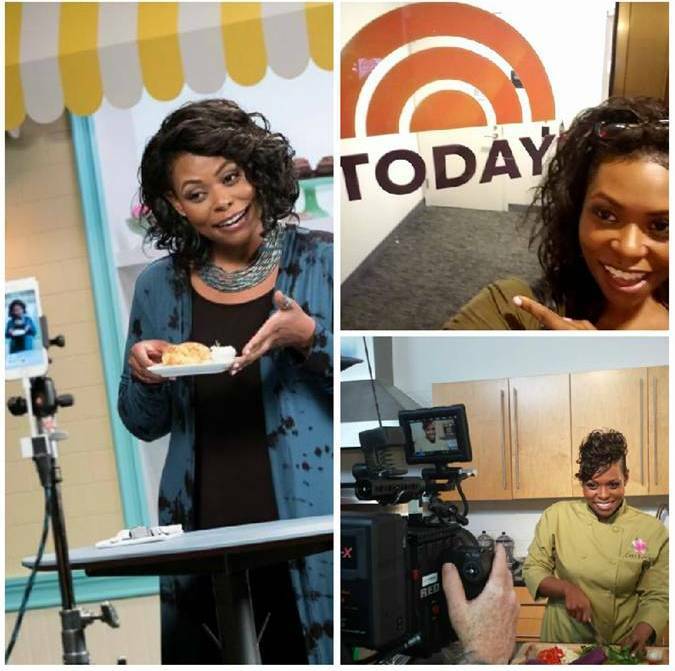 Today this culinary entrepreneur makes regular appearances on shows like The Chew, The Today Show, the Cooking Channel, and the Food Network. She is among the bright lights in the culinary world and a leading subject matter expert in meal planning and entertaining at home. Clash of the Grandama’s judges and host Cameron Mathison (top). 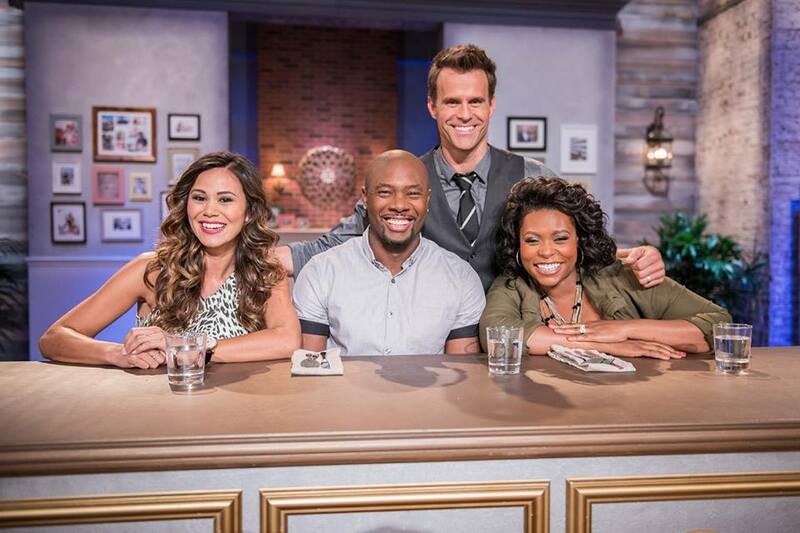 Left to right: Lifestyle expert and POPSUGAR.com Reporter/Producer Brandi Milloy; former NFL player and Food Network star Eddie Jackson; and Food Network Star;Celebrity Chef and Television personality Jamika Pessoa. Photo credit: Chef Jamika. I had the opportunity to meet Chef Jamika last year when I was contestant on the Food Network Show Clash of the Grandma’s. She was as amazing judge filled with charm, personality, insightful and didactic critiques that not only elevated my culinary perspective but helped me become a more descriptive food writer. With the holiday season in full throttle, you undoubtedly are planning your holiday menu or soiree. If not, it has certainly crossed your mind a time or two. This can be overwhelming, even for fairly competent cooks like me. I sent out an SOS to Chef Jamika and she was gracious enough to provide a few practical planning and cooking tips to help allay this seasonal anxiety so you can enjoy the holiday season. She even shares an amazing recipe for a Herb Crusted Prime Rib that the carnivores in your life are sure to love. It’s at the end of the story. Wait. I think I heard a somewhat inaudible “whew – thank you Ms. Collard Greens and Caviar.” And to that I say – you are very welcome! Make sure to visit her site at http://www.chefjamika.com/recipes/ for more mouth-watering recipes and please follow her on Instagram, Twitter and Facebook to keep up with her amazing culinary journey. Without any futher yadda yadda and pithy prose, the following is offered courtesy of the illustrious Chef Jamika. As families begin to plan holiday gatherings, the worry of preparing the food always seems to rest on the “head chef” of the family. With that in mind, here are some helpful tips designed to make the meal preparation a special and stress free one. Plan ahead. There are benefits to being prepared before a big meal. Organizing yourself will mean a smooth transition from start to finish. Purchase food items as far in advance as possible. Waiting until the last minute does not mean that you will get fresher produce or meats. This only means that you will get items that are picked over and of less quality and taste. Prep dishes in advance by freezing casseroles and pre-seasoned meats. On the day of the meal, all you have to do is bake them. This will save time and storage space in the refrigerator. Also, if you are serving hors d’ oeuvres, have them prepped and as the guests arrive you simply pop them in the oven. Hot and fresh hors d’ oeuvres will buy you some time as the remainder of the meal is still cooking. You never want a room full of hungry guests. Cook what you like. Who ever said that you have to serve turkey or ham for the holidays? Change things up a bit by preparing dishes that you and your family enjoy the most. Try debuting some of those recipes you have collected over the year, but never tried. Here is a fun suggestion; before you go shopping, have the kids research recipes they want to see on the table. Make this year’s menu a contributive effort from each family member. Moreover, having family favorites on the table will pay off when it comes time to eating leftovers. Get the whole family involved. Since the holidays are about family, make cooking time quality time. Create kitchen task lists for each person to complete. While you supervise the entire operation, have dad and the kids measure out ingredients, clean vegetables, or even wash dishes. Each person can proudly present his or her involvement in the meal at the table. Do not be embarrassed to hire out. Take some of the pressure off of yourself by hiring a professional catering company or a personal chef for the day. The meal will have just as much meaning, without a lot of the hassle. Private companies and chefs book fast around this time, so make sure you place your order in time. If private catering is not in your budget, your can still seek help outside of your kitchen. Instead of making everything from scratch, try purchasing your breads, side dishes, and desserts from the local bakery or specialty shop. The best way to enjoy a meal is to have someone else do the work. Get creative with leftovers. There is more to leftovers than sandwiches and soups. Get creative! Take those candied yams, mash them and make a sweet potato soufflé. Try using the cranberry sauce to make cranberry muffins. Check out her delicious recipe for Herb Crusted Prime Rib. Chef Jamika says your guests will go crazy when you bring this to the table. Position oven rack on the lowest level and preheat to 450 degrees. Place the garlic, parsley, thyme, mustard, Worcestershire sauce, salt, and pepper into the bowl of a food processor fitted with a metal blade. Process into a coarse paste. Coat outside of rib roast generously with olive oil. Smear the paste over the top and sides of the rib roast. Place the roast bone-side down (fat side up) in a heavy roasting pan. Add cup of water to pan and place in the pre-heated oven. Roast at 450 degrees for 15 to 20 minutes. Reduce oven temperature to 350 degrees and continue roasting for 1 1/2 to 2 hours, or until a thermometer with the tip inserted to the center of the roast reaches 125 degrees. Transfer the roasted prime rib to a serving platter, and let rest for 15-20 minutes. A special way to end the evening is to share your blessings with someone else and give leftover portions to those in the neighborhood or at your local church who are less fortunate. Holidays should be a time of giving and spending time with family. Make this holiday an impressive one by being prepared. Plan down to the smallest detail so that the day is one filled with fond memories and not piles of dirty dishes.